Adam (Tom Hiddleston), has become quite reclusive. Holed up in an old building in an abandoned part of Detroit, he collects vintage guitars and listens to vinyl classics. In Tangier, his lover Eve (Tilda Swinton) looks for Marlowe (John Hurt). Famous for his Shakespeare connection, Marlowe is also known as a source of purified blood that their kind can reliably consume now, because human blood has become dangerously contaminated. Eve returns to Adam in Detroit where they listen to great music, drink the best purified blood there is, talk about old acquaintances like Lord Byron, and drive around Detroit to see the negative and degenerating effect humans have on everything. 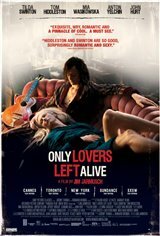 Their nocturnal and decadent idyll is interrupted by Eve’s wild sister, Ava (Mia Wasikowska), whose reckless vampiric ways disrupt the lovers’ domestic tranquility.